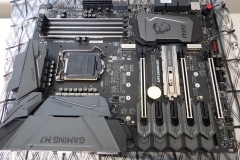 From a gaming perspective, Kaby Lake and the Z270 chipset don’t really bring anything earth-shattering to the table but a new chipset is always a great opportunity for vendors to release new boards with more features and new design elements. 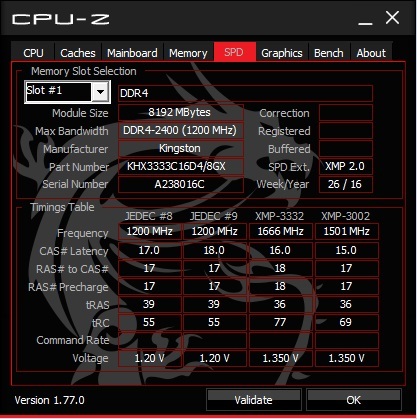 MSI’s Z270 Gaming M7 is an absolute cracker with so much to like. 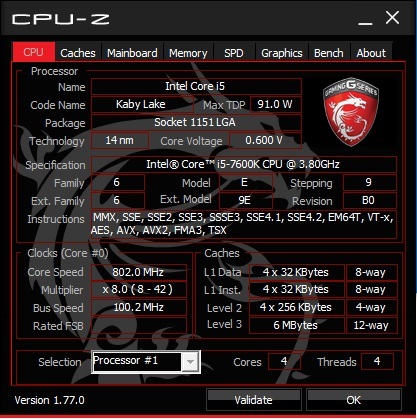 The Z270 chipset is backward compatible with Skylake CPUs but was released in conjunction with the Kaby Lake series. 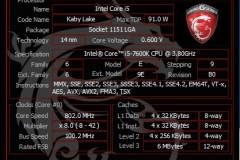 Intel’s 7th generation Kaby Lake CPUs are built on the same architecture as the previous Skylake but include some improvements such as higher clock speeds, ability to handle 10-bit colour content, Intel Optane ‘ready’ and USB 3.1. 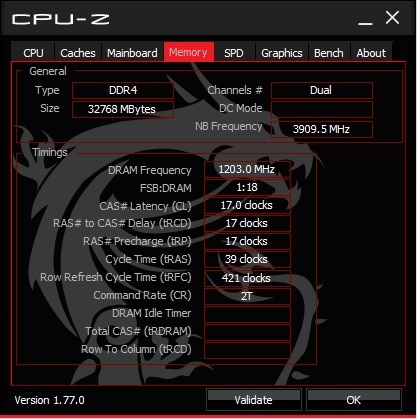 Let’s take a quick look at the meaningful improvements of the Z270 chipset from Intel first. 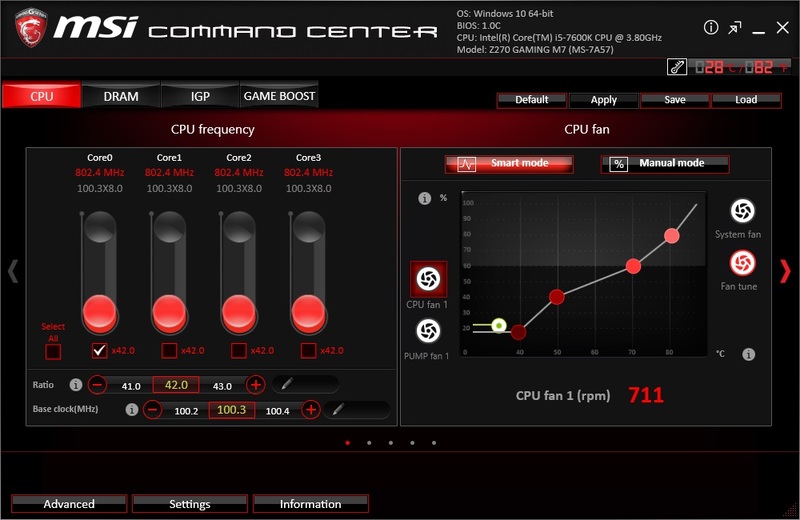 Yep – that’s about it at an Intel chipset level. 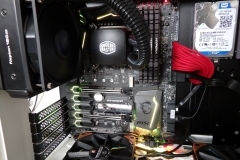 The extra 4 PCI-E lanes will give manufacturers the flexibility to implement more M.2 slots without compromising on other connectivity due to bandwidth constraints. 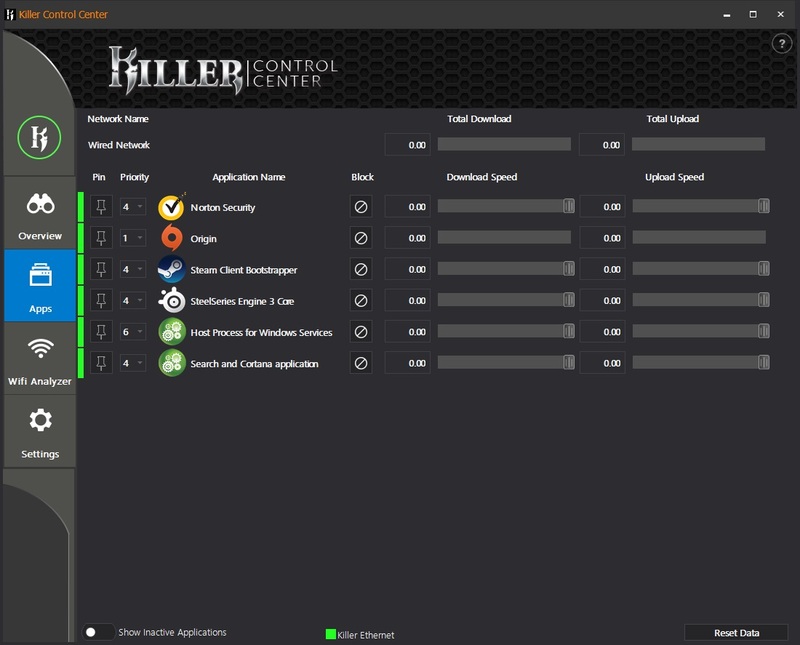 The end result will give system builders more options for their SSD configuration. 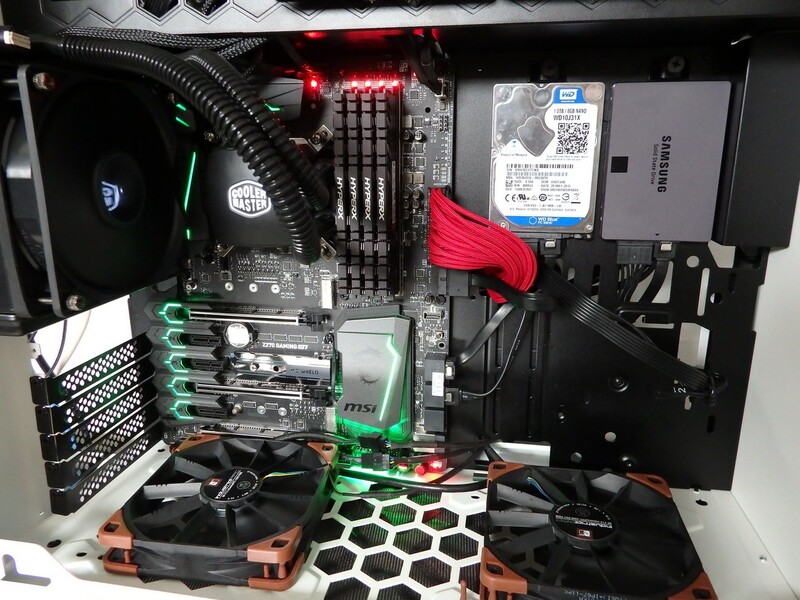 A system with more M.2 drives and less 2.5″ SSDs will need less cables and would benefit from higher data transfer speeds (depending on the M.2 device selected). 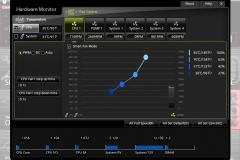 Intel Optane technology is a high speed non-volatile memory solution. This is new tech and not currently available for consumer products but it’s expected to be released in 16 and 32GB capacities to act as a cache for the Kaby Lake CPUs (not previous generations.) 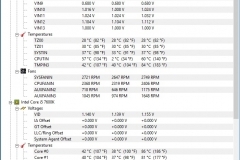 Unlike a RAMDISK cache, Optane is non-volatile so it will retain data through a power cycle. 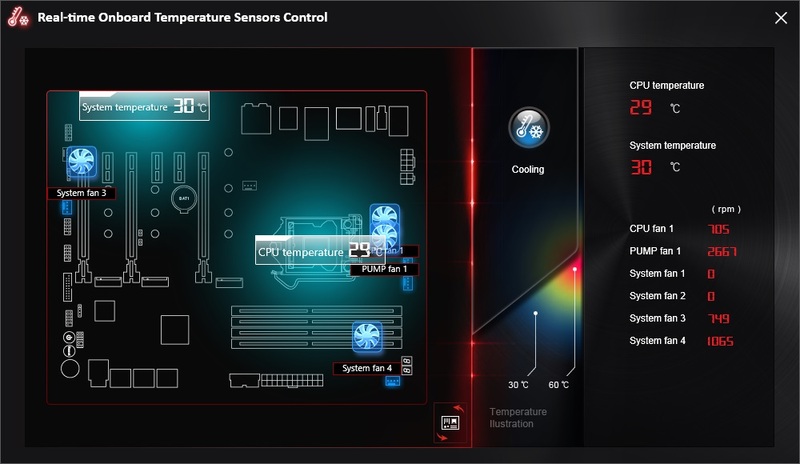 Whilst these features are useful and will provide benefit, the chipset update isn’t really reason enough to buy a new board. 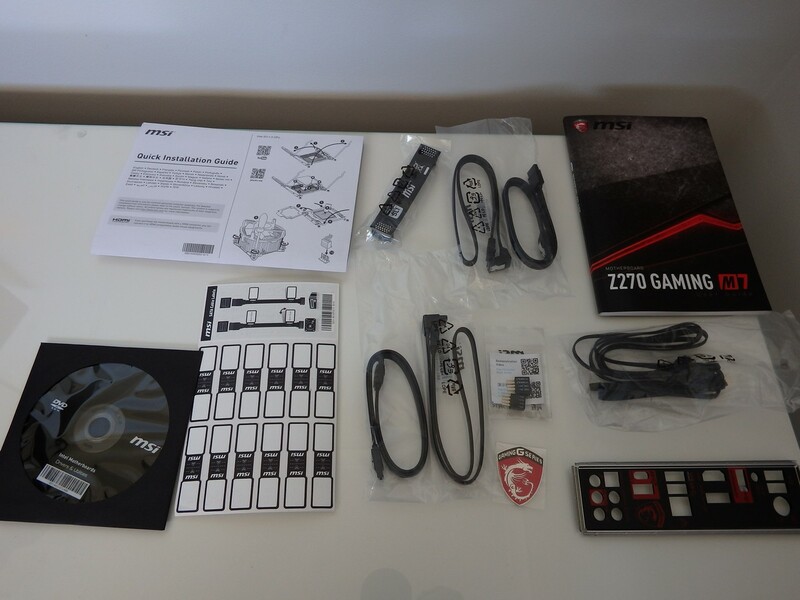 Luckily for enthusiast consumers, Z270 is simply the base platform and there are a lot of other manufacturer-specific features that have evolved since the last release of Z170 motherboards. 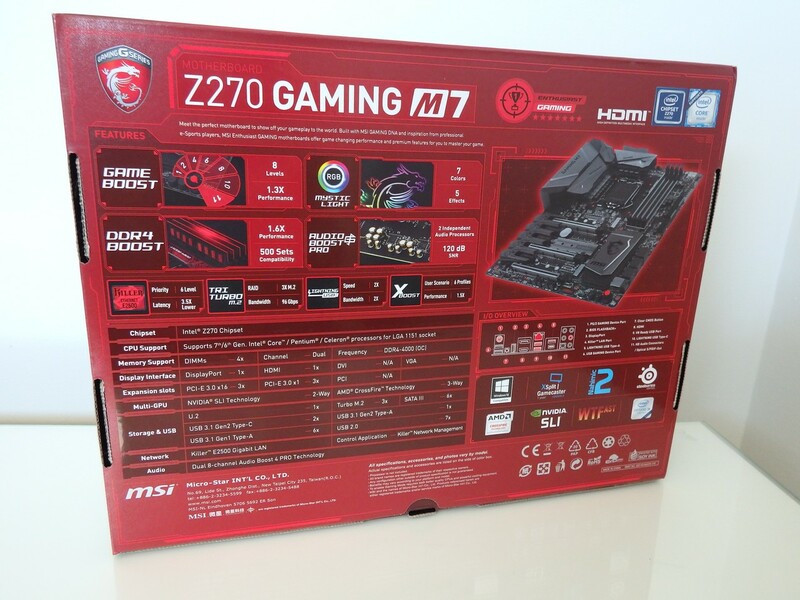 MSI looks to have taken this opportunity with both hands, so to speak, and the Z270 Gaming M7 is a board that I’d love to call my own. 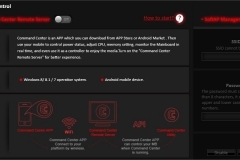 Once you read through the features and testing, the reasons will become very clear. 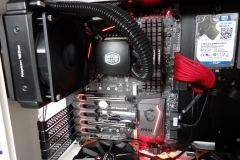 From a gaming perspective, the core technology uplift of Z270 and Kaby Lake isn’t going to have the masses rushing to the stores and upgrading. 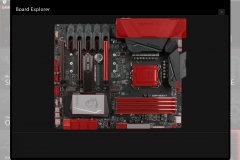 The thing I liked most about the platform change was the reason it gave MSI to refresh their series of boards with new tech and some new aesthetics. 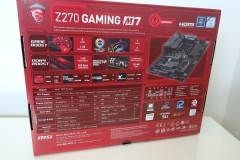 The Z270 Gaming M7 is a good example of product evolution – let’s look at the features below and then I’ll list out the specifications. The first thing you notice with this board is the lighting – the RGB LEDs are present all over the board and there are 7 colours with 5 effects available. 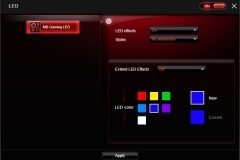 The software is easy to use and it makes the design colour agnostic. 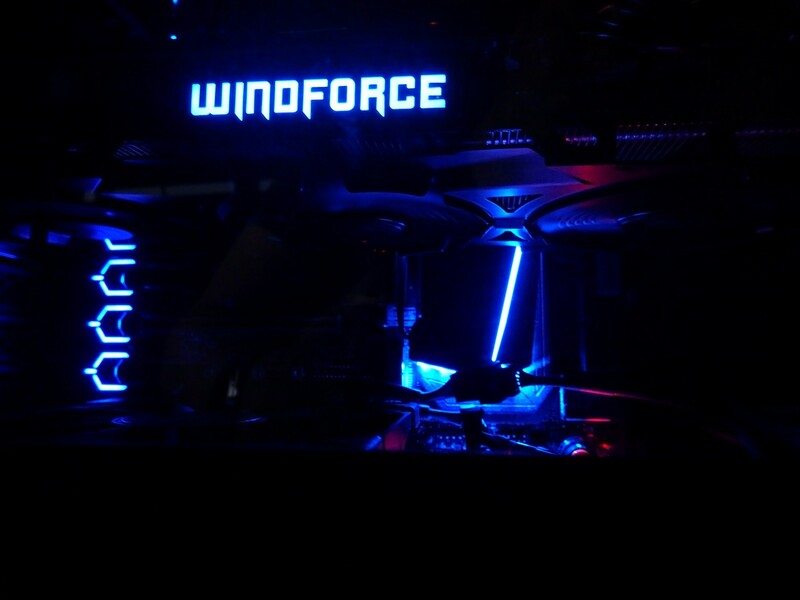 During testing we found that the darker blue was a perfect match for the Blue LEDs on our Gigabyte GTX 970 Windforce graphics card. 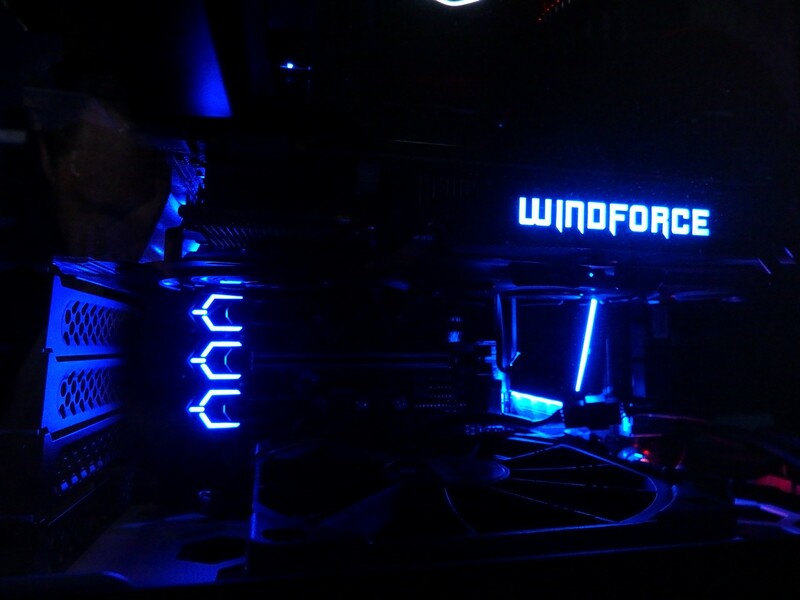 There is also a 4 pin RGB strip header on the board and an 80cm extension cable with splitter so that you can extend the Mystic Lighting effects to fans or case lighting for an even better effect. 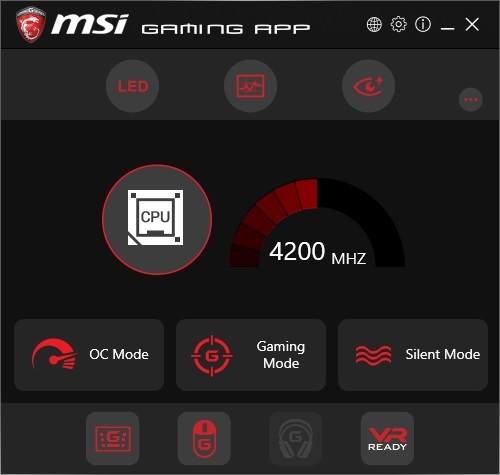 If you have a graphics card like the GTX 1080 Gaming from MSI, the Gaming App also syncs with the LED on that product as well. The Smartphone app also allows you to change the effect without needing to switch out of your game. 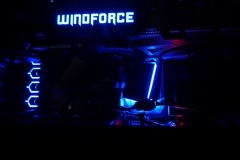 The cool looking steel highlights are more than structural re-enforcement, MSI designers have also added Electromagnetic Interference protection to key areas of the board to make it perform better when being tweaked beyond the rated specification and also to make sure that it has a fighting chance against heavy components (graphics cards) and clumsy system builders. 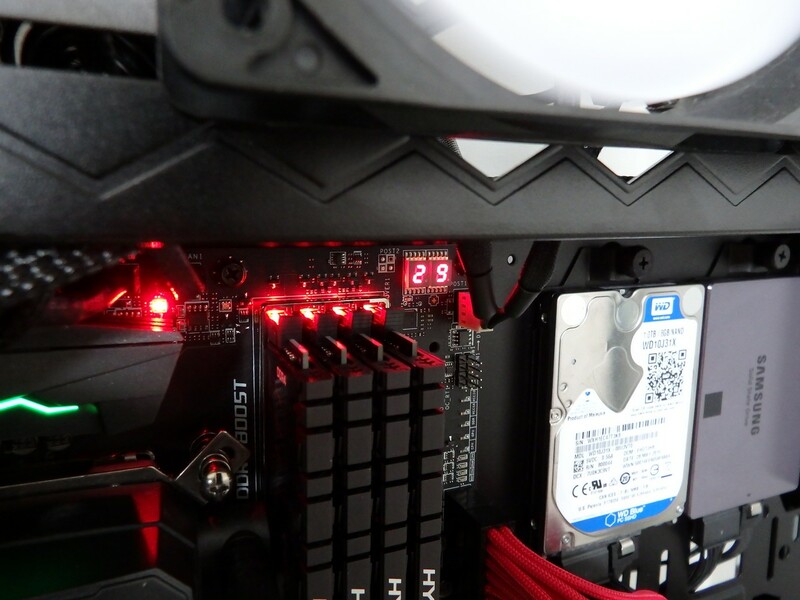 There are three 80mm M.2 slots with one having a thermal shield that both looks cool and protects the M.2 SSD from performance issues linked to heat. 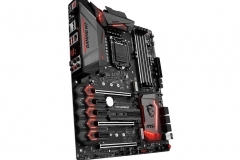 We see ‘armour-like’ protection on the M.2 slots, the PCI-E slots and the DDR4 slots. 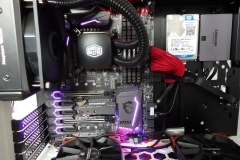 In the case of the M.2 and DDR4 slots, the protection is Electro Magnetic Interference based but there is also a level of protection from physical damage. 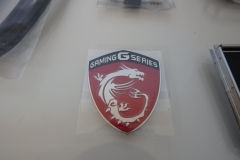 We also see the inclusion of 32Gb/s U.2 connection with a durable steel ‘armour’ protection. 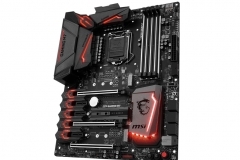 One of the things that I’ve personally liked about the MSI boards in previous generations has been the focus on durability with Military Grade rated components. 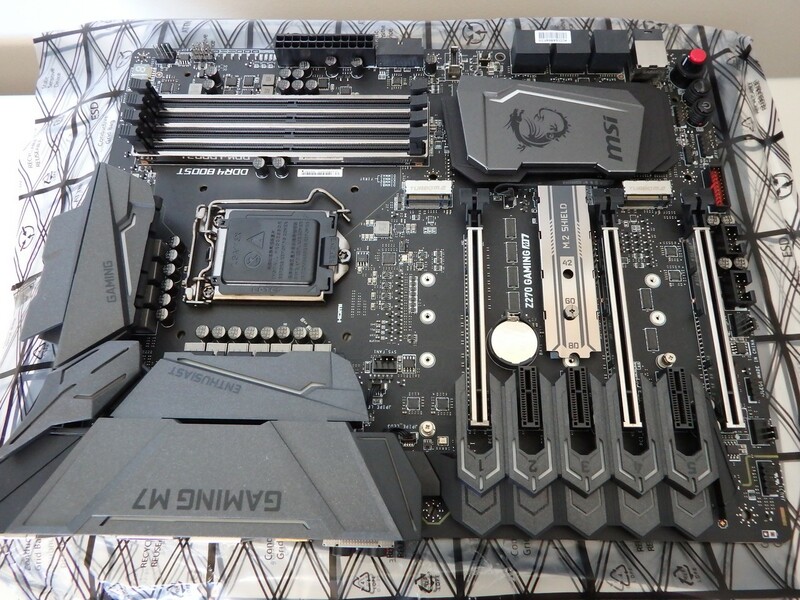 The Z270 Gaming M7 is no exception with Military Class 5 chokes and caps plus the other Electrostatic discharge and circuit protection measures built into the board. I’d much rather upgrade from a working board than replace a damaged one – this board is built to go the distance. The board layout is well thought through. 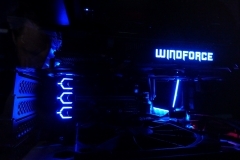 The fan headers are both well placed and more functional than previous products. 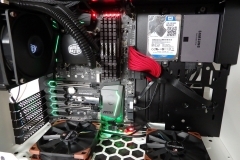 The design includes DC/PWM headers, Pump (up to 2 amp) – 6 fan headers with Fan mode indicators with red LEDs on the board indicating that the fan is under motherboard control and green indicating that the fan is not being managed by the Z270 Gaming M7 BIOS. 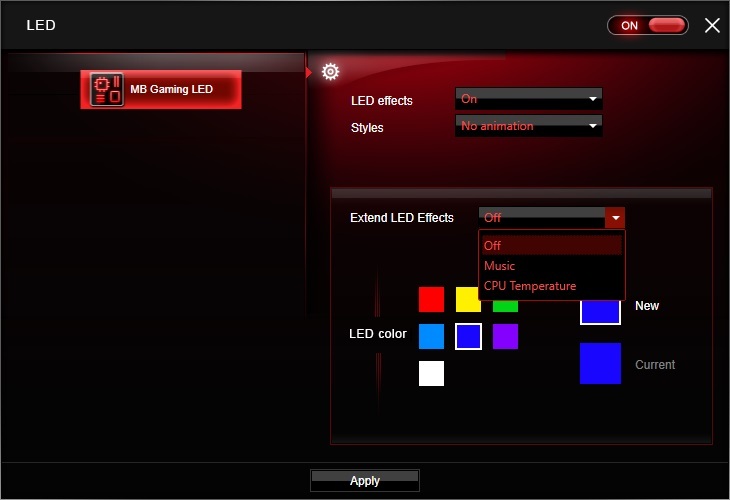 Overall, the layout provides a good basis for a neat build where the Mystic Lighting can be seen with maximum effect. 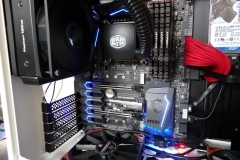 The power connections are in the standard locations but the CPU power connection had me scratching my head for a second as there is the standard 8-pin but also an additional 4-pin. 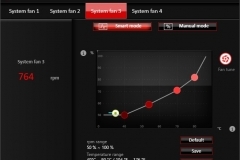 I asked MSI about this and they advised that it was there for extreme overclocking and not something the average builder needed to worry about. There are also more indicator lights on the MSI Z270 Gaming M7 that I can recall seeing on a motherboard in the past. 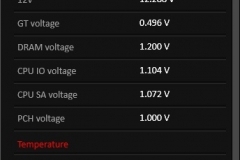 Indicators for fan modes, POST progress, RAM status, power, temperature and error codes. There are also a few buttons to allow more control when tweaking or testing and basically eliminate the need for front panel IO when testing the board. 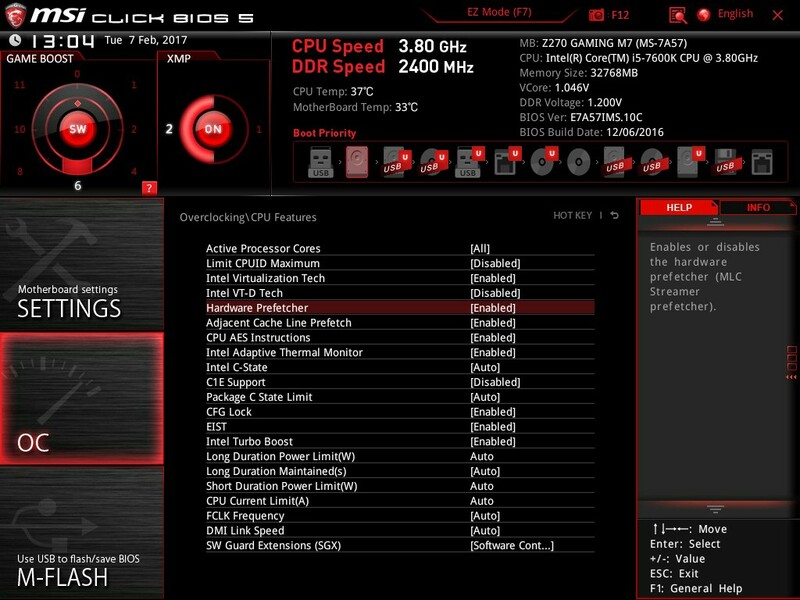 The switches integrated into the motherboard are Power, Reset, Game Boost (equivalent of the older OC Genie) and BIOS Flashback. 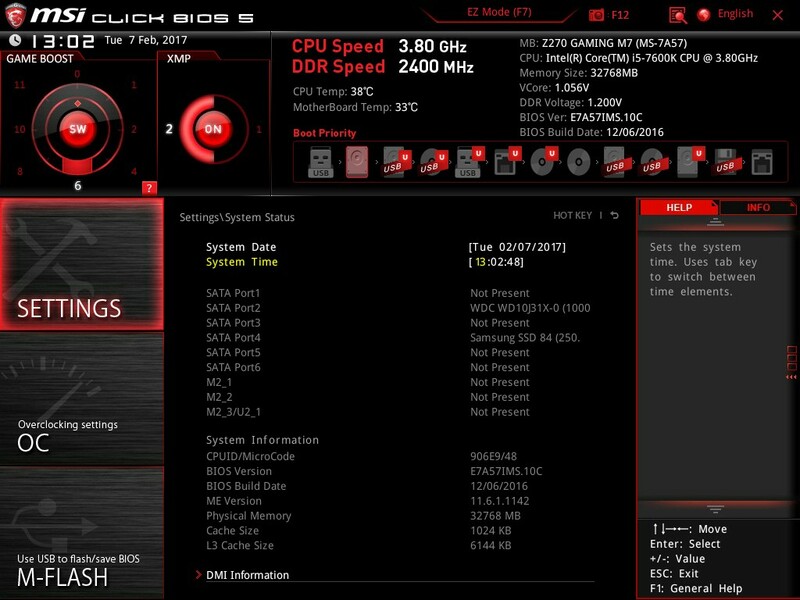 BIOS flashback is a nifty feature that allows you to update the BIOS without a CPU or RAM present. 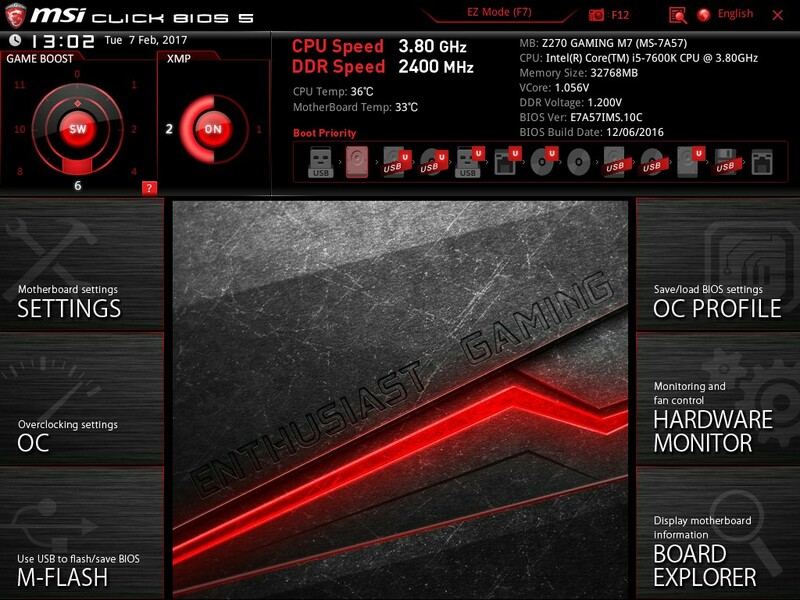 The BIOS is also excellent – MSI state that it’s a Gamer’s BIOS and I mostly agree. 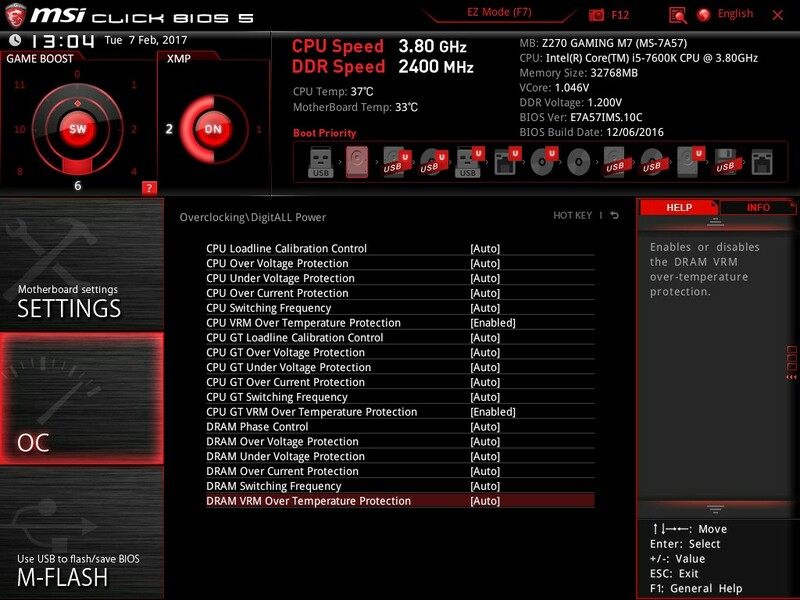 The BIOS takes the pain and guesswork out of overclocking with good results but it’s also a tweaker’s BIOS so they shouldn’t undersell it here either. 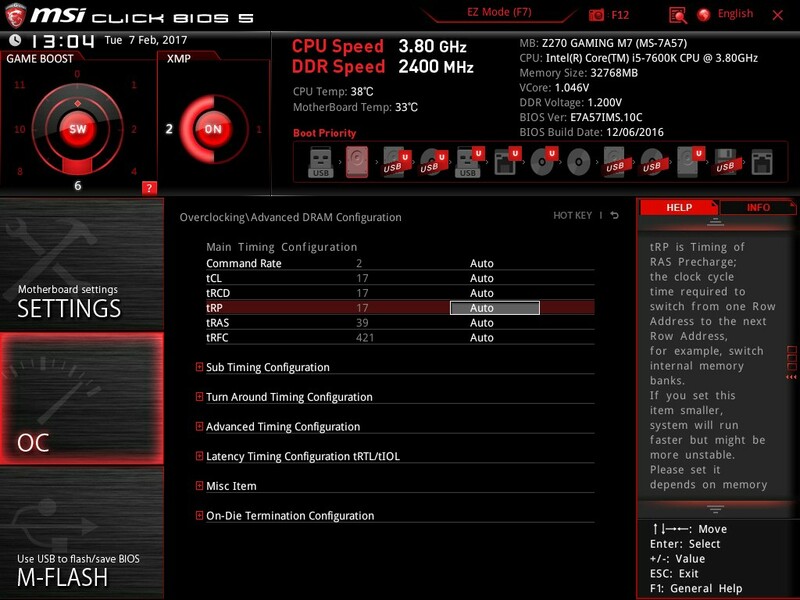 The BIOS options allow you to overclock with ease but if you do want to learn more, the options are easily accessible. 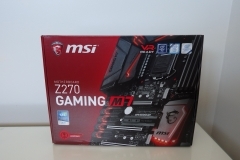 The Z270 Gaming M7 is also focused on immersion with VR Boost and one click VR. 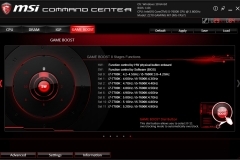 The VR Boost chip filters the signal so that your VR Headset (connected to the optimised and labelled port) receives a clean and consistent signal for optimum performance. 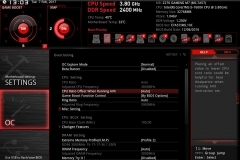 This of course will depend on the other components that you have in your build. The rear IO shield has these ports clearly marked to avoid confusion. 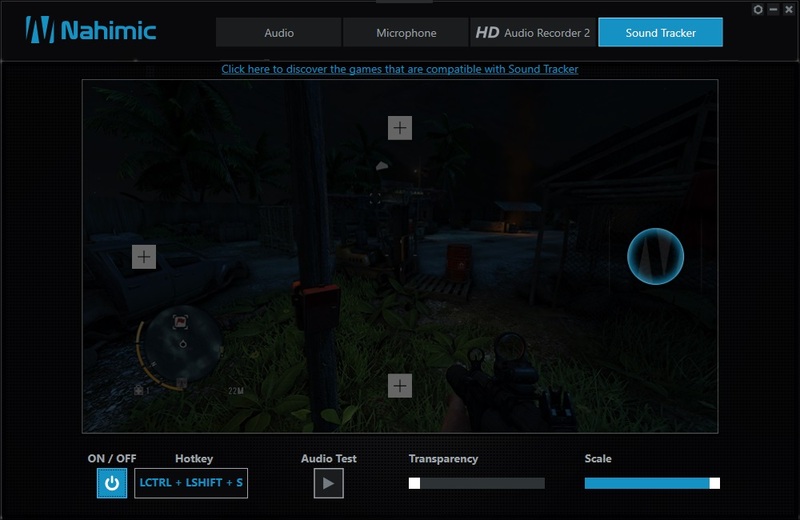 Whilst we’re talking about immersion, let’s talk sound. 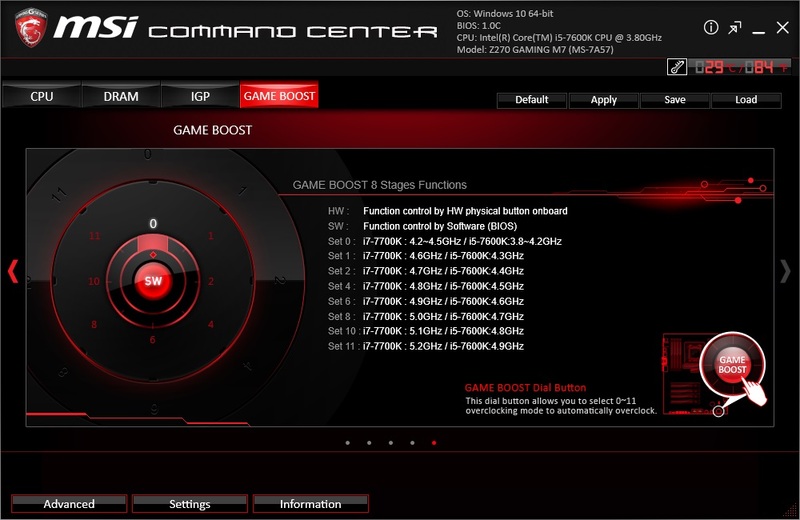 The Z270 Gaming M7 uses MSI’s Audio Boost 4 Pro. 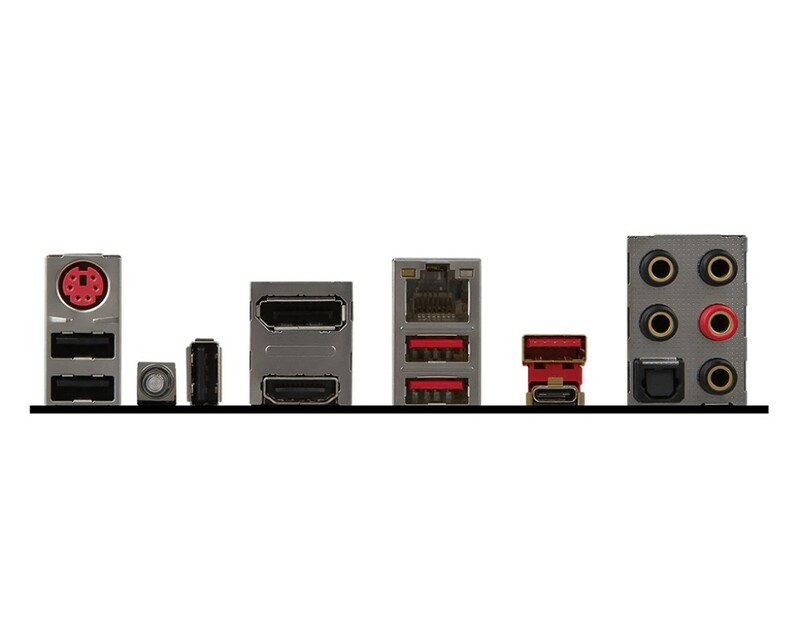 The rear audio ports have gold plated connectors for ultimate signal transmission. 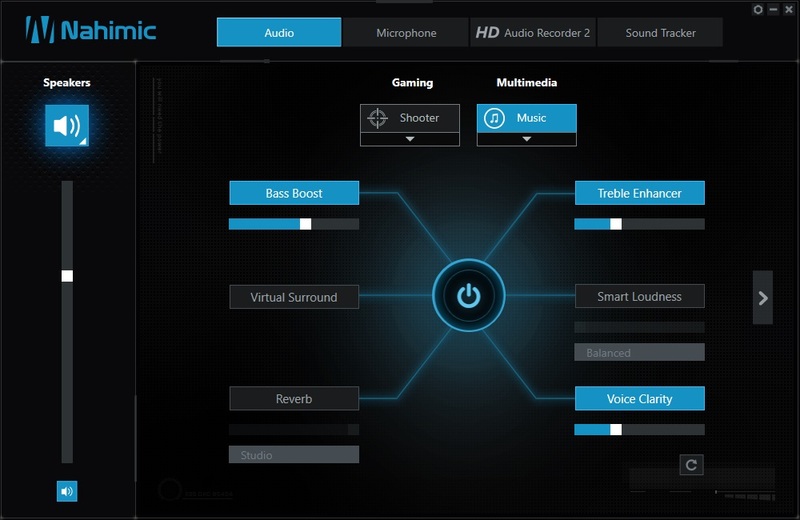 MSI has included not one but two of the Realtek ALC1220 audio processors with separate amplifiers so that you can use front and ready audio sources at the same time. Historically, manufacturers would implement sound processors so that the rear audio ports are amplified and the front port header wasn’t. 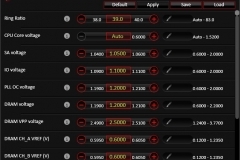 This is a notable and very welcome change. 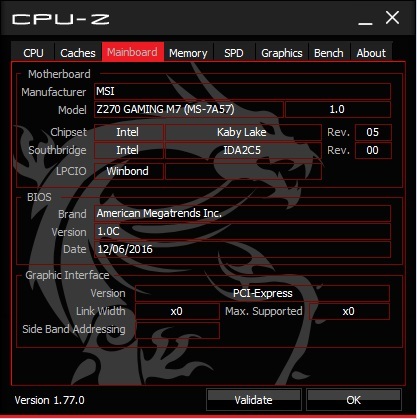 Sound processor isolation is also implemented at a PCB level on the Z270 Gaming M7 – this isn’t new and we’re glad to see it continued in the design. There is a strip that shows the audio section of the main board isolated at a PCB level. There are even different PCB layers for the left and right channels. 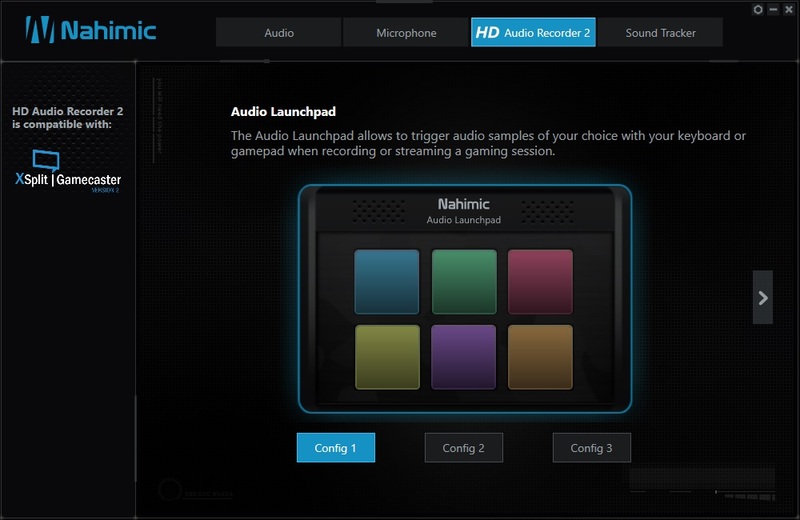 I have mixed feelings on the Nahimic 2 technology – but nothing against the product as a solution. 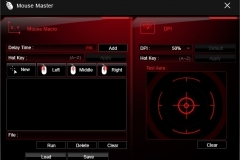 It can give a competitive advantage by enhancing direction through visual cues, footsteps and providing great virtual 7.1 sound even on a dual driver headset. 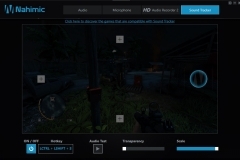 It sounds great, allows you to get your sound exactly as you like it on a personal level but with the right tuning, you could tweak it in a way that the game designers didn’t envisage to obtain an advantage over other players. 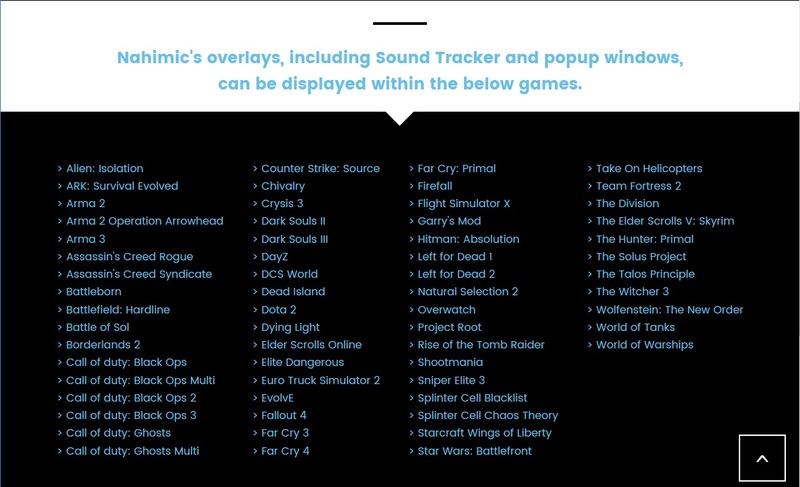 That aside, Battlefield 1 has one of the best in-game sound offerings going around and I thoroughly loved playing it on this board. Fallout 4 as a slightly older title remained clear and the ambience, music etc. 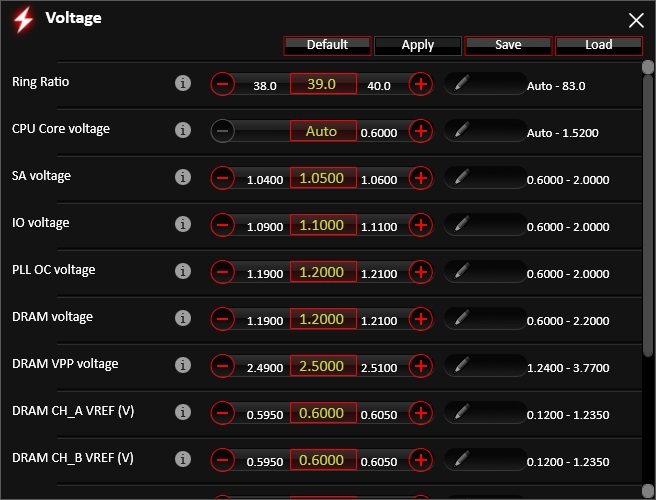 was enhanced by the clarity coming through my headsets (yes, I tested more than one headset with this board). 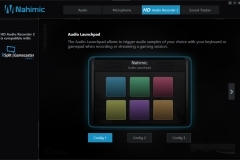 Nahimic 2 offers voice shaper and voice leveller at a mic level but when it comes to the speakers, there are 10 equaliser bands, 4 gaming pre-sets, 3 audio profiles and 6 EQ pre-sets with a single custom profile. Personally, I’m never going to use all of these but better to have them than not. 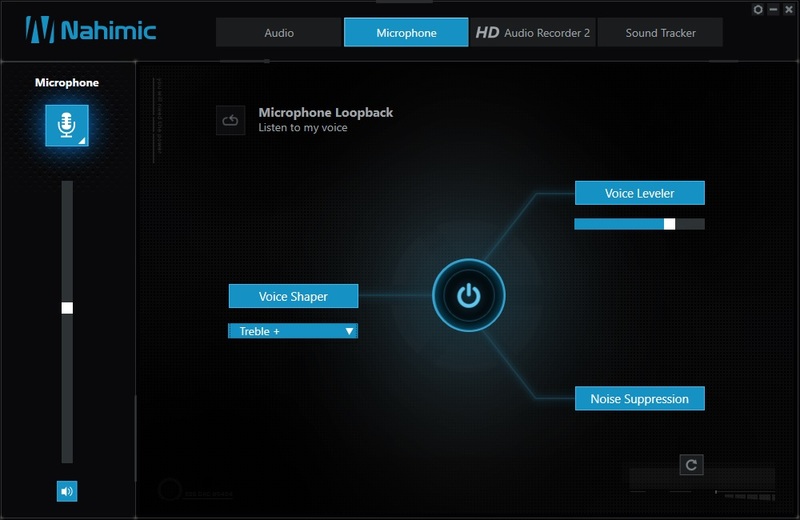 The User Interface is very intuitive and simple to make the adjustments that your ears desire. 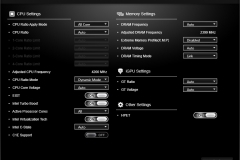 Killer LAN (E2500) has been around for a long time as well but the implementation and software combination feels a little more polished than before. 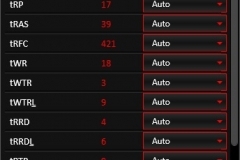 We already had QOS implemented on our ASUS RT-AC68U router so we needed to disable it for our testing. 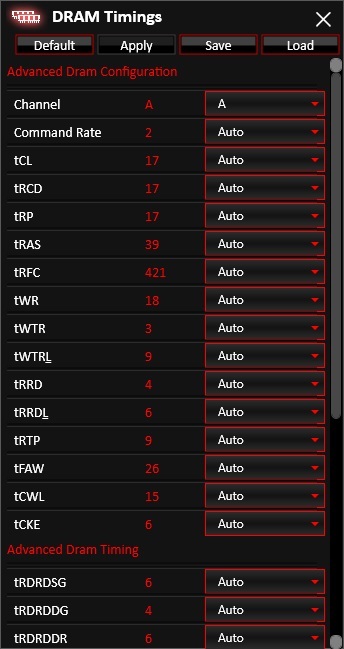 As an aside, the ASUS RT-AC68U is a brilliant product and one of my best purchases at a network level. 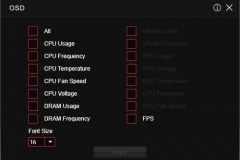 The MSI/Killer software works as advertised and we didn’t see any issues when playing on Australian servers for our multiplayer games. 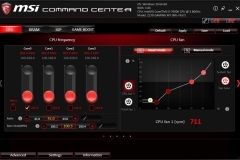 It seems to shape the traffic at a local PC level very effectively. 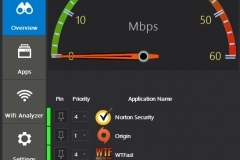 There were a couple of times where we noticed high pings but this was actually caused by another device on the network uploading files to a cloud service and unrelated to the test – someone here clearly missed the memo about testing timeframes. 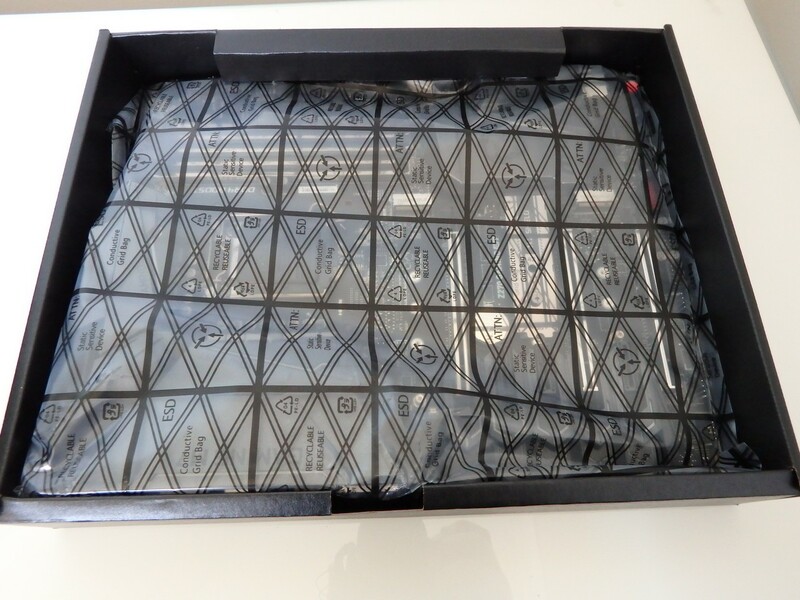 There is a surge protect function up to 15KV (above the standard 6KV) and the LED lighting in the ports is also really handy when trying to find the port in the dark. 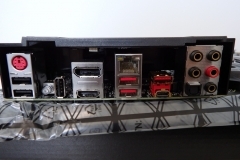 USB connectivity is pretty extensive – there are enough headers on the back I/O for gamers but the internal headers consist of 1x USB Type-C (ASMEDIA 2142) 4xUS 2.0 ports, 2x USB 3.1 Gen 1 via 2 discrete headers. 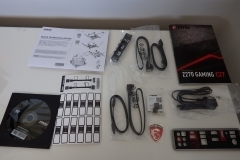 The important thing to note here is the implementation of the ASMEDIA 2142 USB3.1 Gen 3 x 2 which offers up to 10Gb/s for a single device or up to 8Gb/2 for 2 devices. 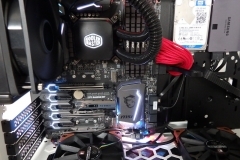 Gold connectors have been used. 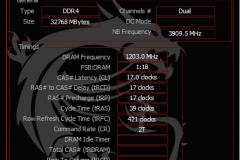 When comparing boards, it’s worth looking at this because the alternative ASMEDIA 1142 used by some other boards has less bandwidth, providing only up to 8Gb/s for a single device or 4Gb/s each to 2 devices. 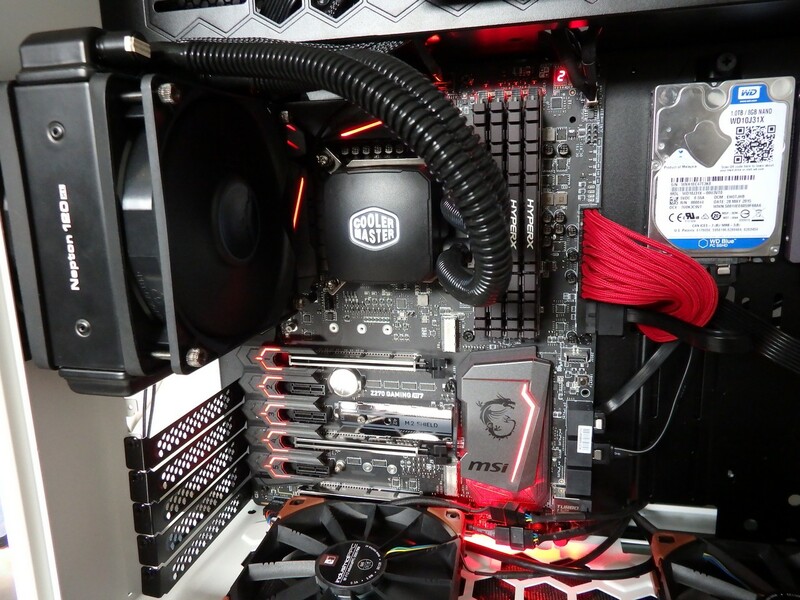 The internal Type-C header is good to see but currently of little value as the cases with front panel Type-C connections are extremely limited at the time of writing. 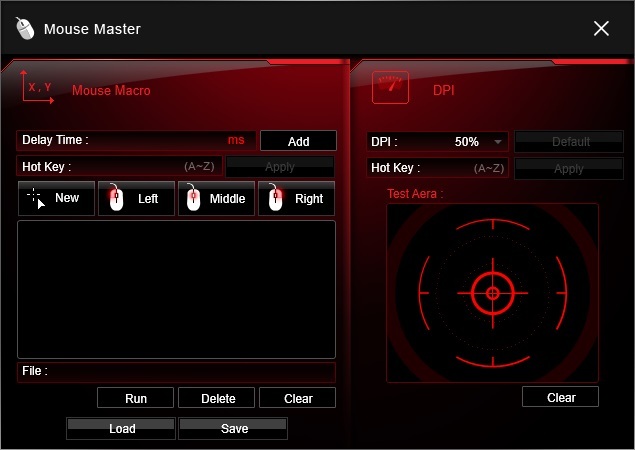 Finally, MSI is boasting double ESD protection for USB devices with shielding to protect your system from copping damage due to a faulty USB device. 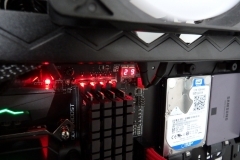 Electrostatic Discharge can be a nightmare when a faulty USB key or hard drive hits your rig. I’ve see it once and that particular Z68 motherboard ended up toast. 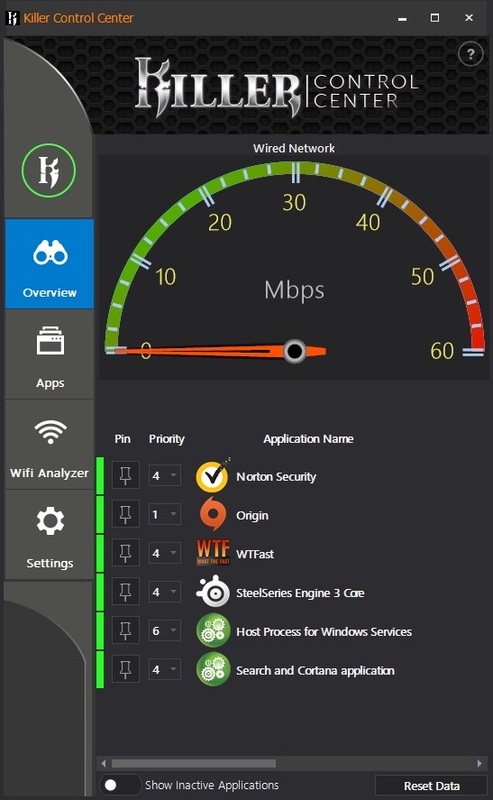 I really appreciated the UI of the software offering, the consistency of the interface despite the separate applications and the lack of needing to reference the manual. 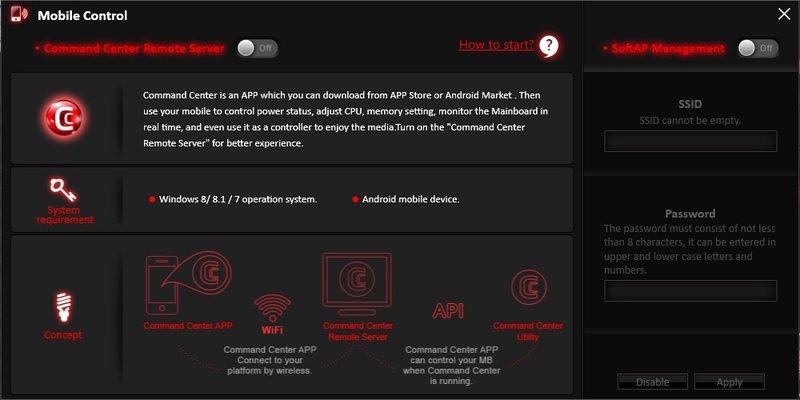 The Command Center application is familiar from previous encounters. It is robust and regularly updated. Live update is also reliable and kept our drivers and application up to date without any fuss. 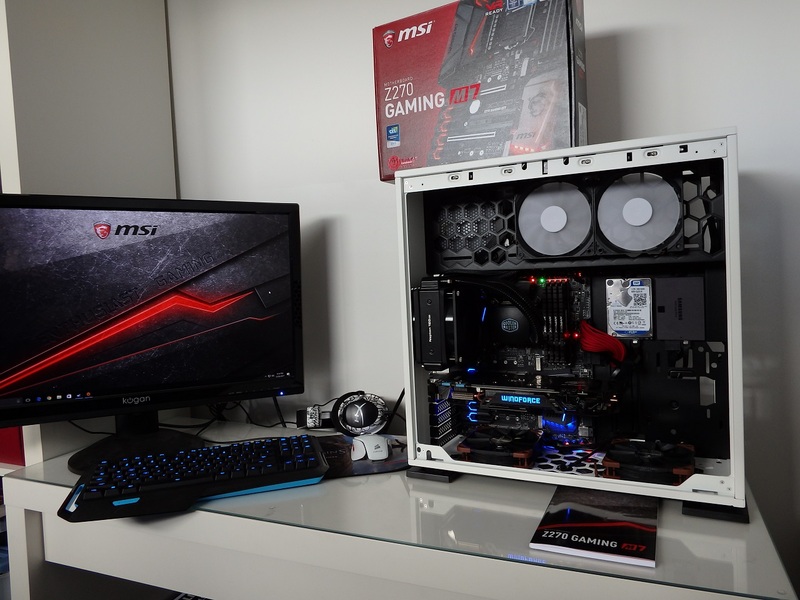 The MSI branded CPUz application is included on the installation CD along with a cool MSI branded wallpaper – whilst you don’t need them and could go with a generic CPUz / personal preference wallpaper, they do look good and match the physical appearance of the board. 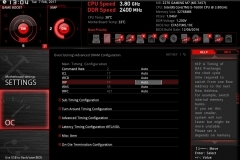 I’ve always been a fan of the MSI Gaming App since the first version and although the tweaks to it over the journey have been relatively minor, it’s good to see that the development team keep looking for improvements. 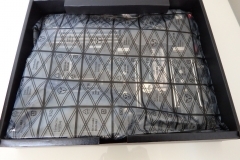 The whole unboxing process was pleasant with a clear focus on quality and all of the inclusions needed to get you started. 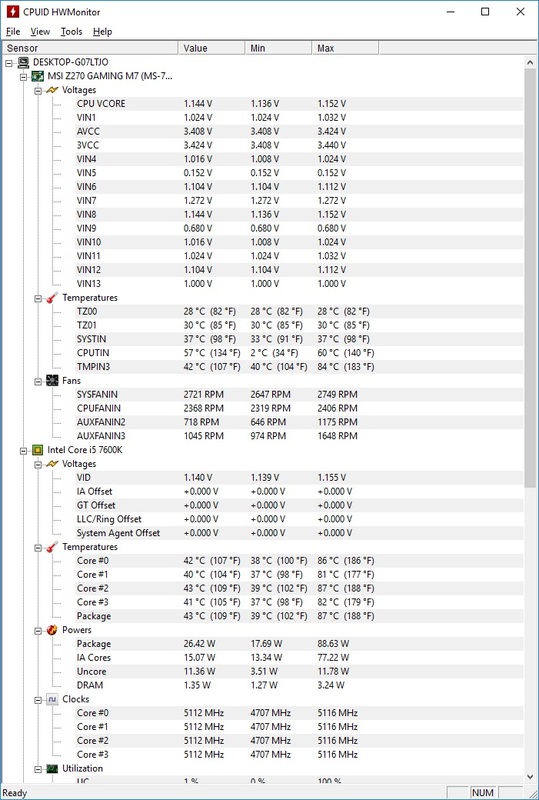 In terms of build quality, I only had the board for a month but didn’t see any issues. 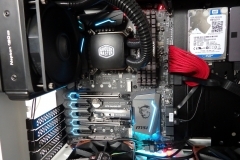 To back up my firm belief that MSI’s build quality is tried and true, we have been using a Z87 motherboard from MSI for about 3 years in GelatiMan’s gaming rig without any issues at all, the GTX 760 HAWK graphics card has been overclocked and used in many showcase/feature builds without dramas and the R9 380 graphics card has also been subjected to significant benchmarking and is a key component of our AMD test system. 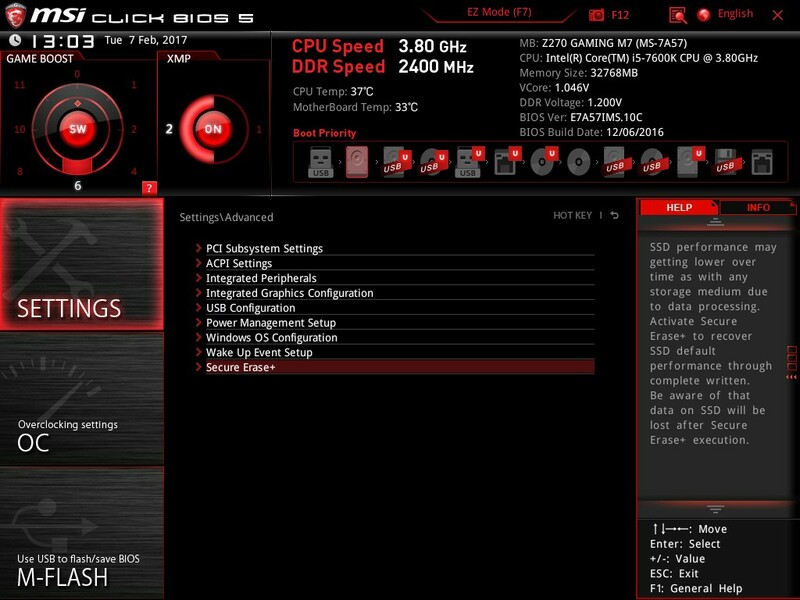 Further to this, the standard test bench that we use is based on an MSI X99S Gaming 7 motherboard and an MSI GTX 980 Gaming 4G graphics card. 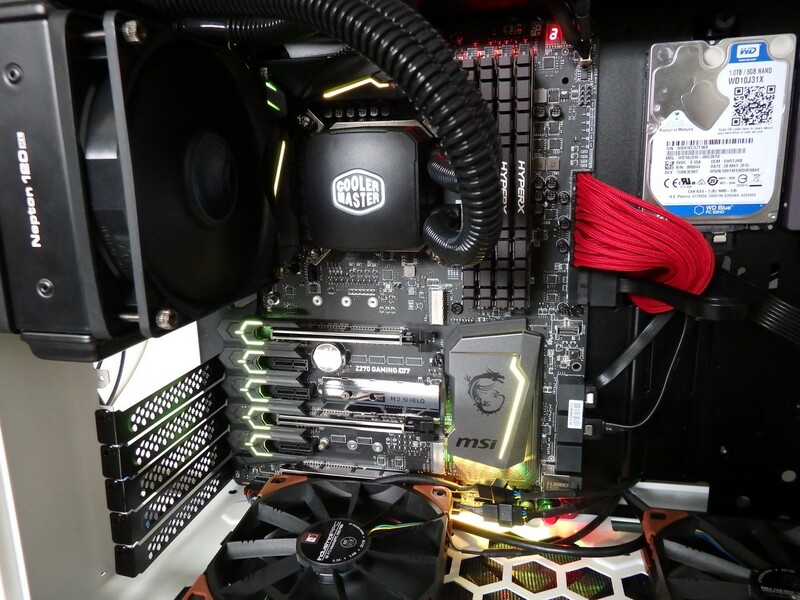 These components have been used every day since we received them, moved around, overclocked and gamed on heavily. 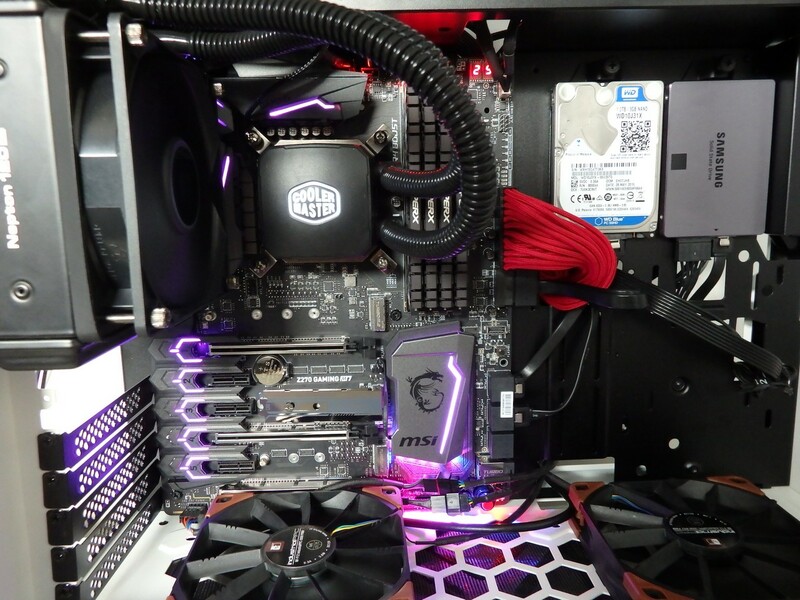 To date, we have not seen an MSI component fail from our review samples – and we keep most review samples that we receive/review for longevity testing/comparison purposes. 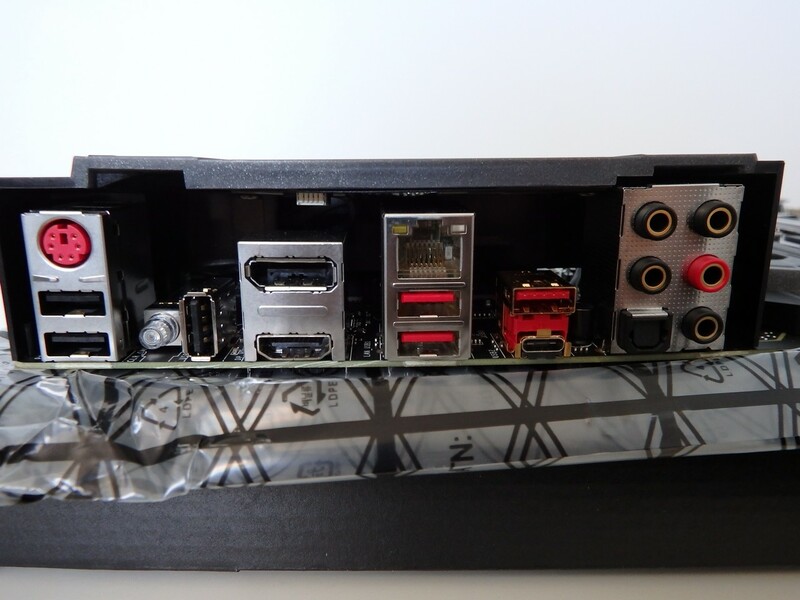 The rear I/O layout is pretty standard with the old yet still popular PS/2 connector, 3xUSB 2.0 Type-A ports, 1 CLR CMOS button, DP & HDMI video ports, 1 RJ45 LAN, 2 USB 3.1 Gen1 Type-A, 1 USB 3.1 Gen2 Type-A, 1 USB 3.1 Gen2 Type-C, Optical and 3.5mm Audio ports. The omission of a DVI connector is worth the trade-off for the variety of USB connections. 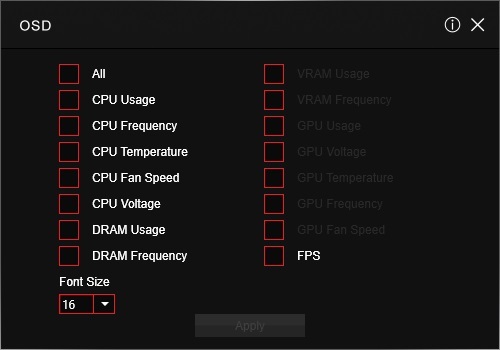 * This function will be supported depending on the CPU. 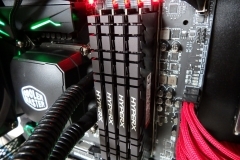 • Supports Intel® Smart Response Technology for Intel Core™ processors* M.2 and SATA ports maximum support 2x M.2 PCIe SSDs + 6x SATA HDDs. 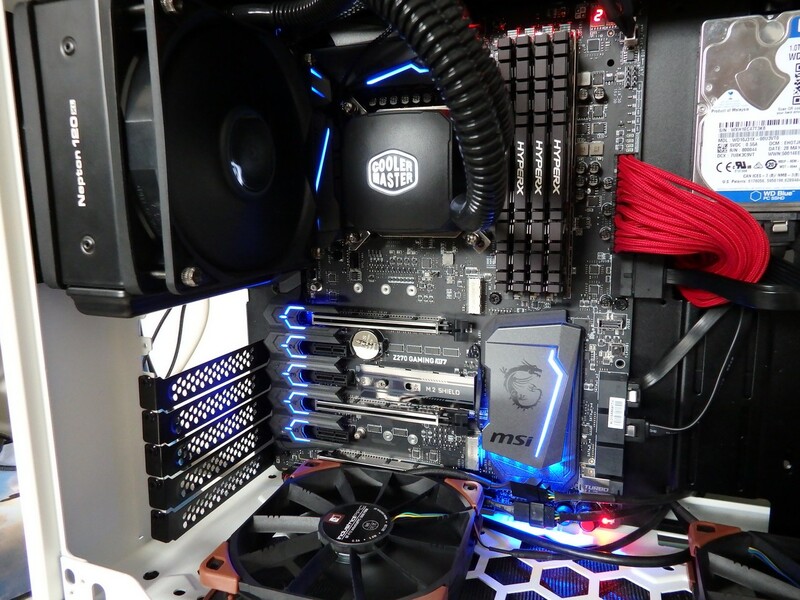 The test setup was built in our In Win 303 chassis and doubled as our practical build. 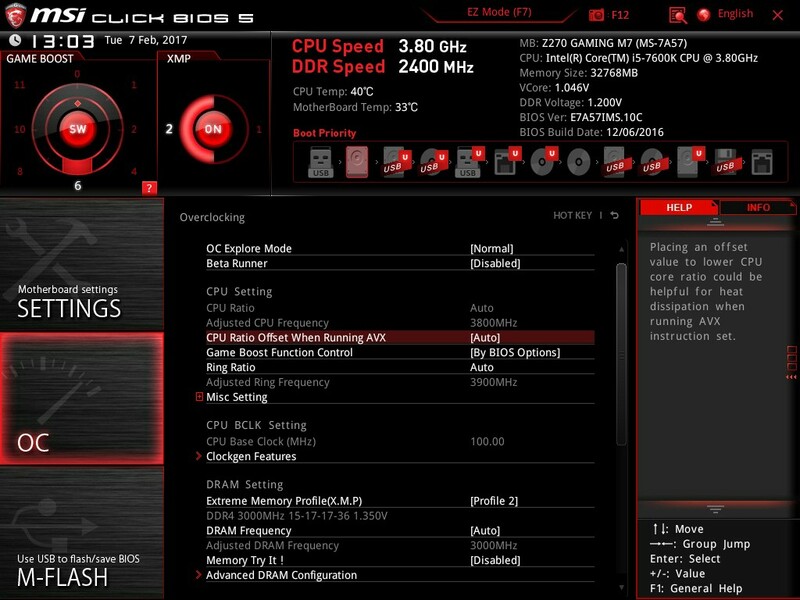 Overclocking is made easy by the software and BIOS with pre-sets available to reduce the effort involved for the less experienced gamer who just want to crank up their unlocked CPU. 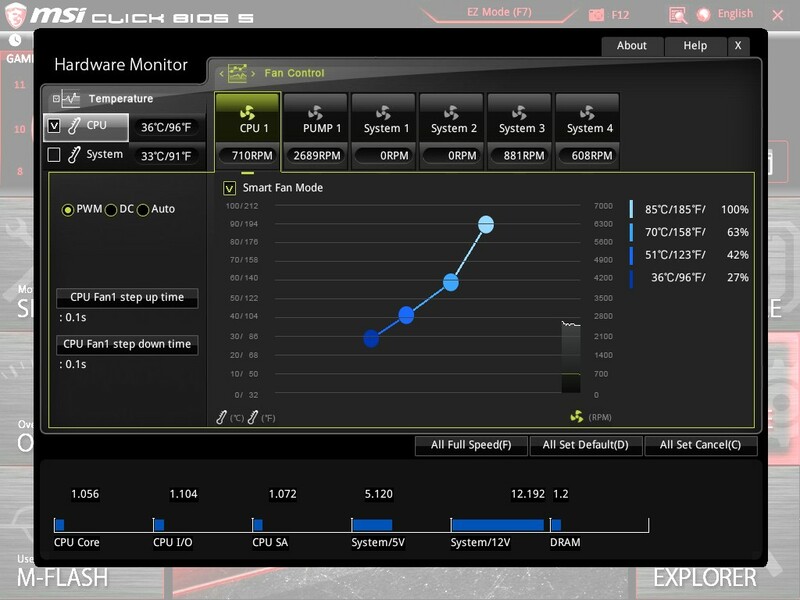 Whilst this was ok, I managed to get a stable 5GHz with some manual tweaking and a game-stable 5.1GHZ from our borrowed i5-7600K CPU. 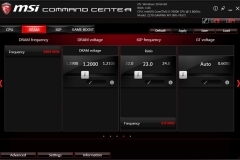 I say game-stable because it wasn’t as rock solid under a sustained prime95 or OCCT test but when gaming, it didn’t seem to miss a beat. 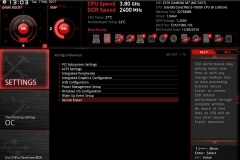 The interesting thing was the MSI hardware monitor had the VCORE at 1.37v but our tried and true HWMonitor from CPUZ was reporting it as much lower. 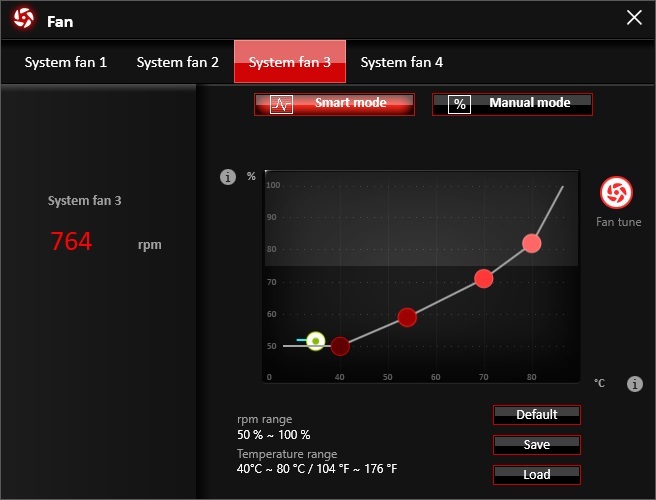 The temperatures would indicate that the MSI monitoring tool was more accurate as we saw the cores going over 80C. 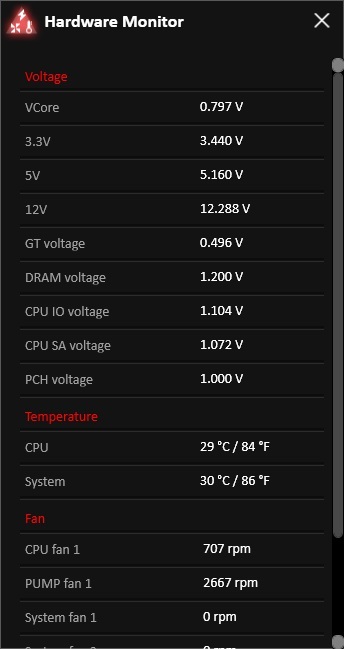 I was only using a single 120mm AIO cooler and the temperatures would have undoubtedly been better with something larger. 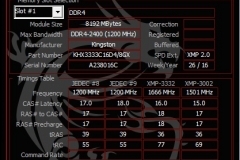 The XMP profiles of our HyperX Predator DDR4 3333MHz 4x8GB memory were found and I didn’t have any issues at all with compatibility or stability. 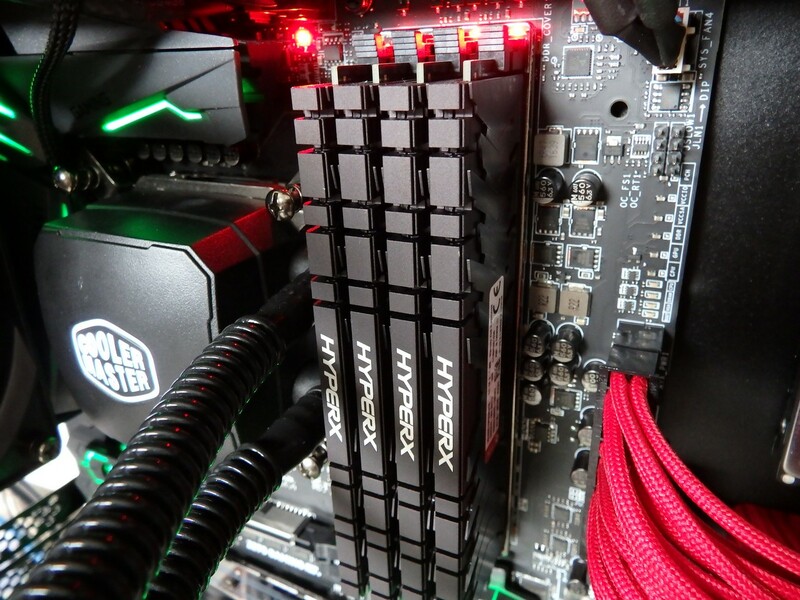 As an aside, That HyperX Predator memory looks great with the chunky heat spreaders – in this motherboard it provided the desired balance of performance and aesthetics as there are enough LEDs on the motherboard already. 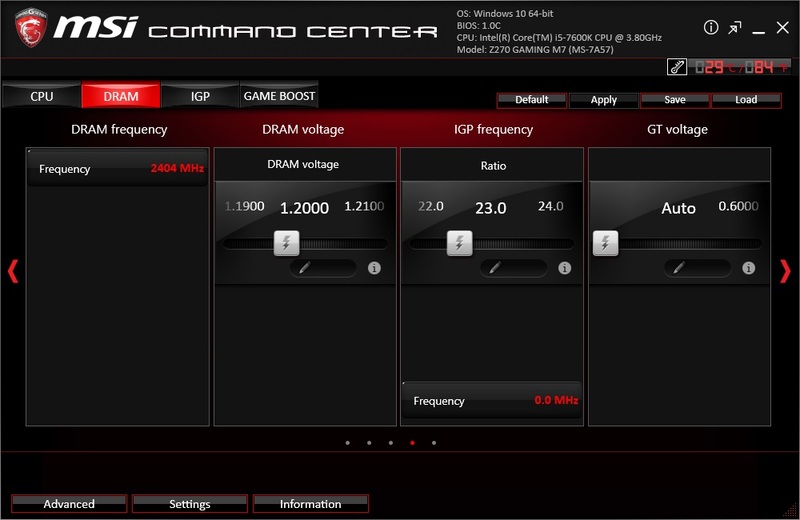 The XMP profiles worked a treat in our testing and there is a little LED that tells you when XMP is active. 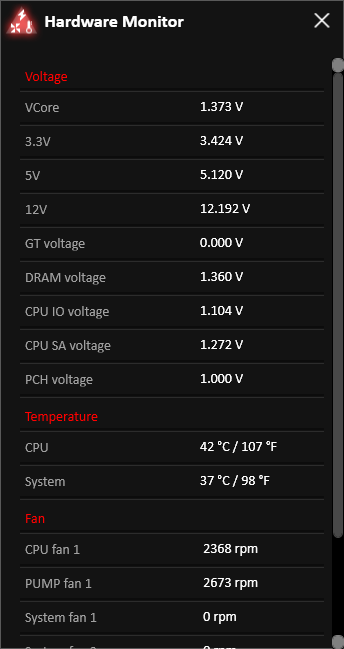 I also liked the Error-code read out that also tells you the CPU socket temperature once the system has successfully booted. Nice touch and slightly smaller than we’ve seen on previous boards so it looks pretty sharp without dominating the top right corner of the board. The Audio performance of this board was excellent. 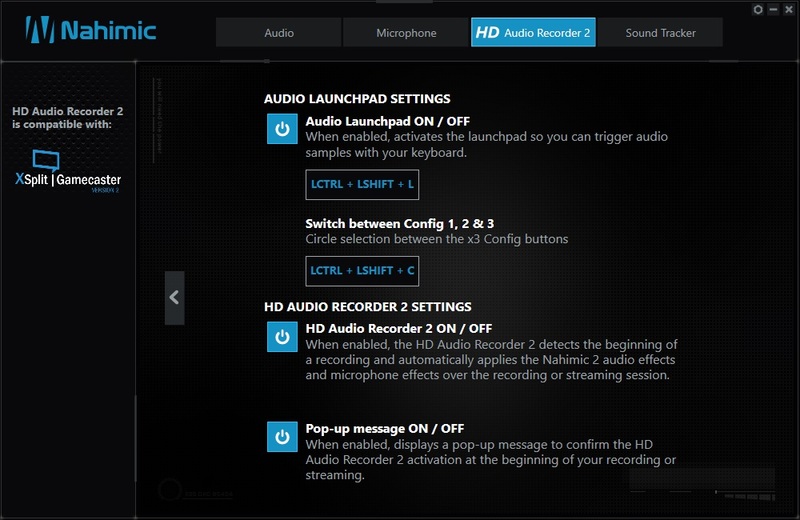 I tested it with a Kingston HyperX Cloud (Mav Edition) headset, a Hyper X Cloud Revolver and via 3.5mm input to a Logitech G933 headset – then for good measure I also tested it with a set of Logitech Z533 desktop speakers. The audio experience was outstanding. 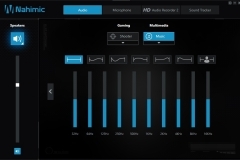 I tested rock, pop, jazz, classical and live music with crowd noise and acoustic guitar. 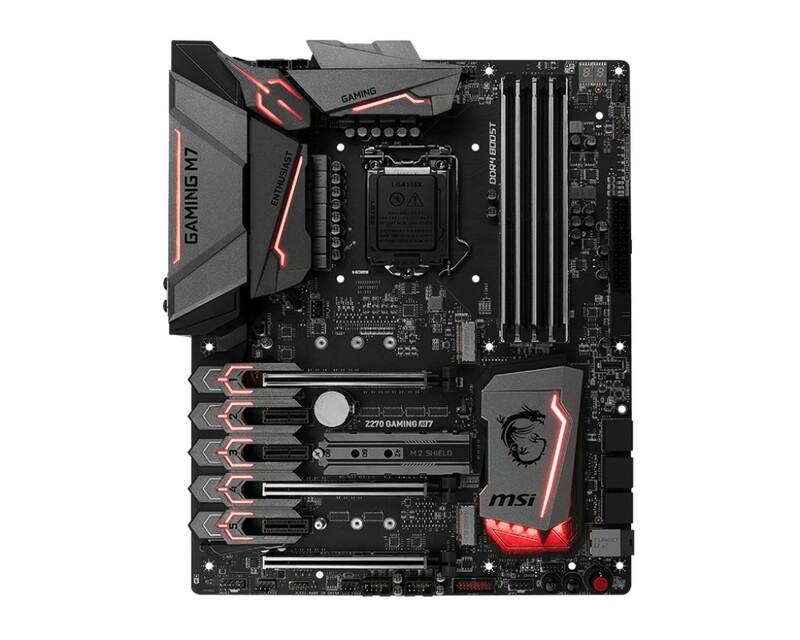 Listening to Chris Cornell’s “Songbook” album was great and I’m actually listening to music via the Z270 Gaming M7 as I write this review. First person shooters were extremely enjoyable, whilst other titles such as World of Warships, GTA V, Project Cars and The Division were completely immersive. 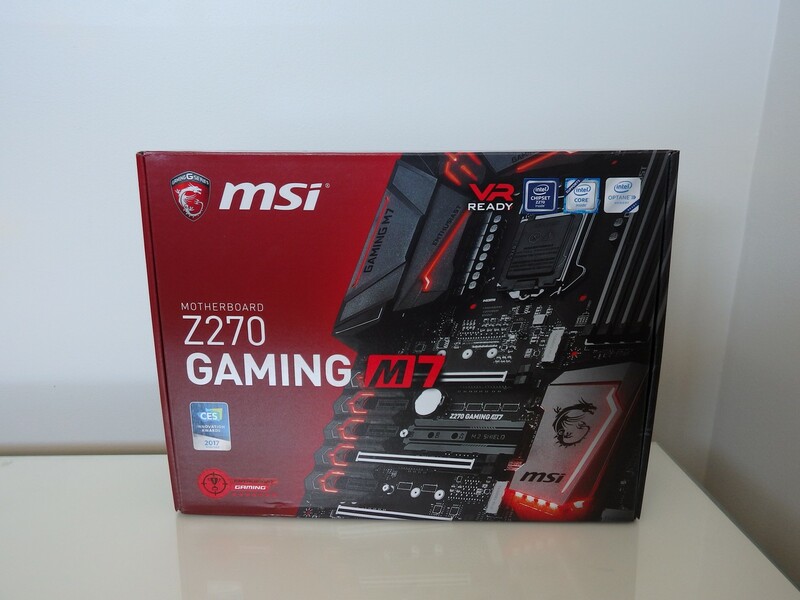 The MSI Z270 Gaming M7 was solid as a rock on a hardware level, gaming was a dream, the utilities and drivers proved to be error free, intuitive and felt ‘premium’. 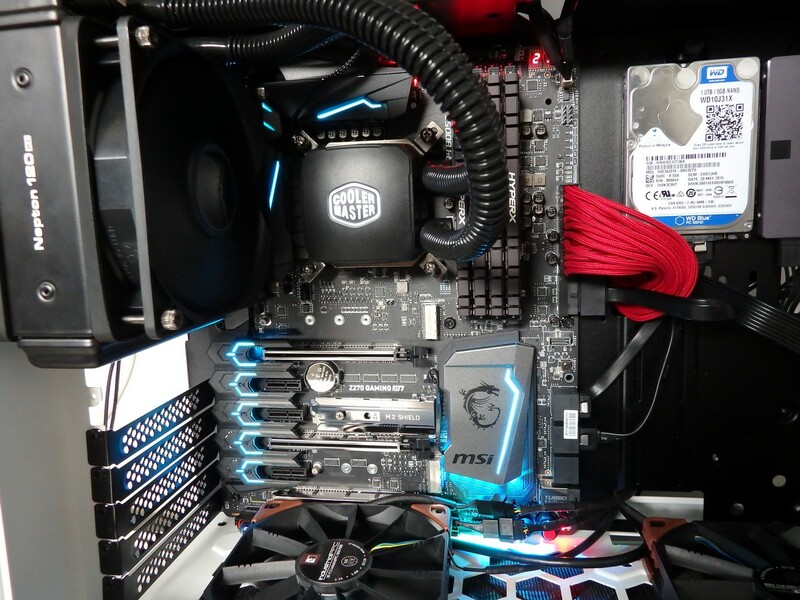 After a month with this board, it delivered everything I’d want from an enthusiast motherboard, let alone a gaming product. 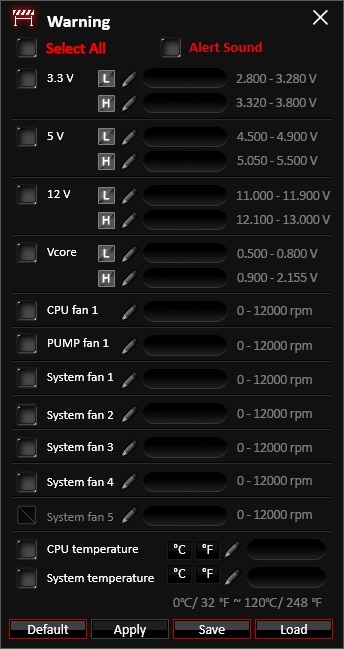 The hardest part about the testing was identifying the ‘hero’ feature of the board. 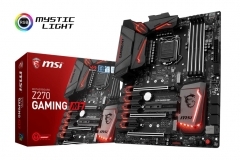 The software package is one of the things that come to mind as it makes using the Z270 Gaming M7 easy and means that you can easily take advantage of the features without a deep technical knowledge of the underlying technology. 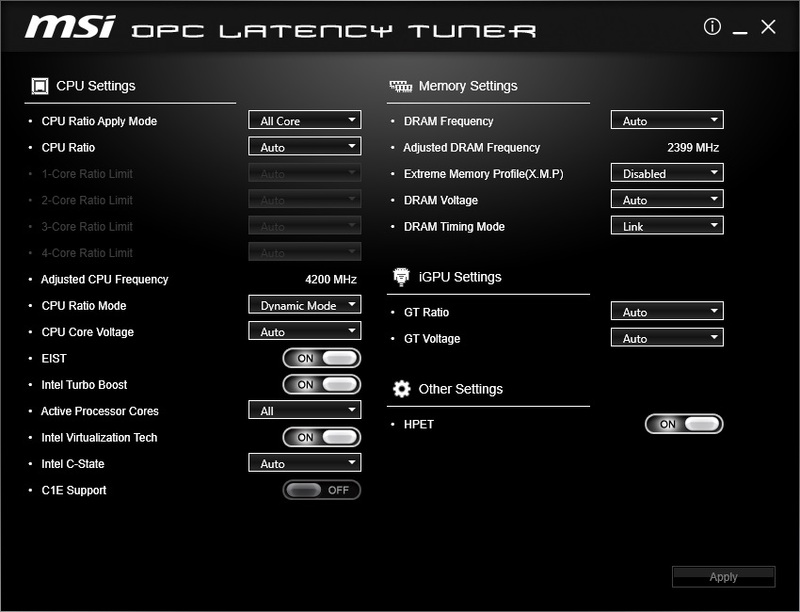 Overclocking Stability is also up there as a key point along with the aesthetics and RGB options. Network through-put seemed to be limited by the storage device speeds and our Gigabit network with the read / write speeds for different sized files aligning with our X99S test bench at just under the theoretical maximum of our Gigabit network with no other devices switched on to impact the testing. At no point did I feel like any competitive edge was being held back by crappy ping times. 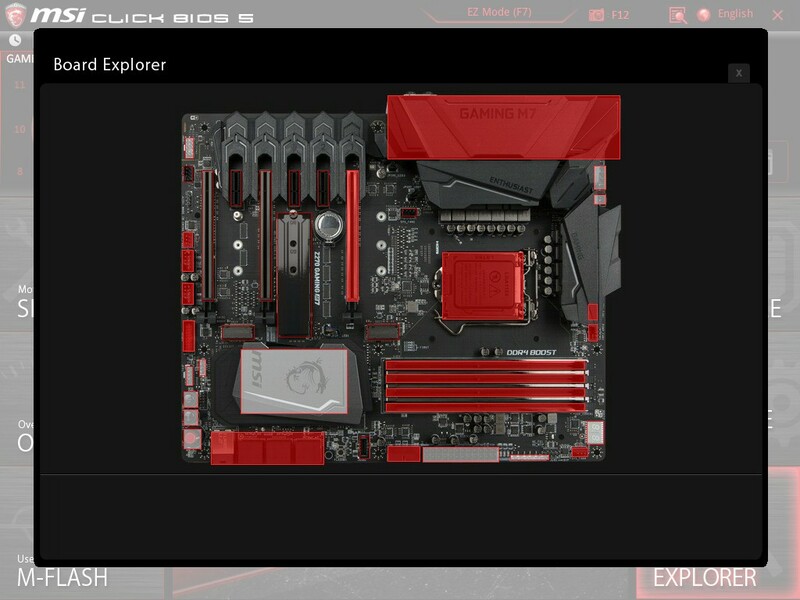 The one thing that stood out perhaps just a touch more than the rest was the audio performance of this motherboard. 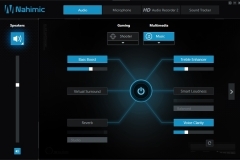 The sound when listening to music or gaming just felt ‘right’. 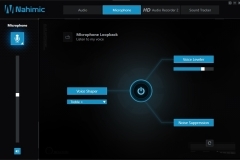 I tried 3 different headsets and one set of desktop speakers, finding that although each headset was little different, the sound experience was top notch. 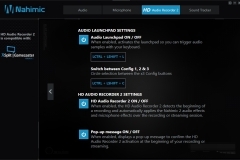 The audio software is easy to use and doesn’t take much time at all to tweak. 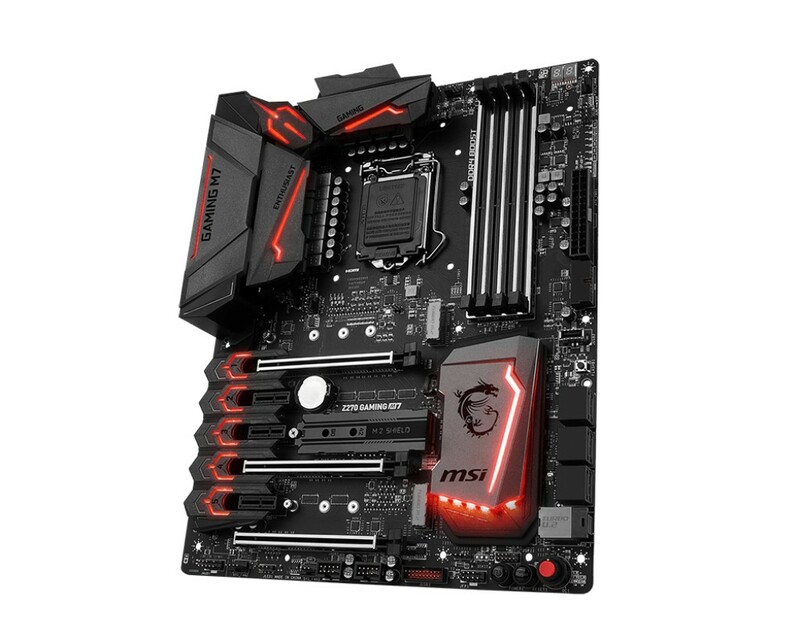 When gaming, the sound track and effects in games like Fallout 4, any first person shooter and racing games can make a big difference to the level of immersion so I weight the audio performance of a motherboard heavily if it’s marketed at gamers – like this one. 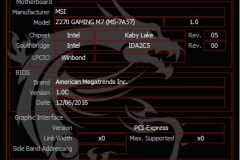 At the time of writing, the MSI Z270 Gaming M7 has a street price of $419. Yes, that’s a lot of dosh and there are cheaper versions like the M3 that still have many of the features I liked such as the Audio Boost 4 / Nahimic 2 sound platform. 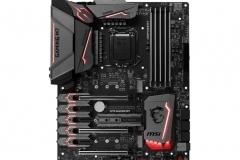 With the features and capabilities in context, I can’t consider the price of this motherboard to be a negative or ‘Con’ for the conclusion below. 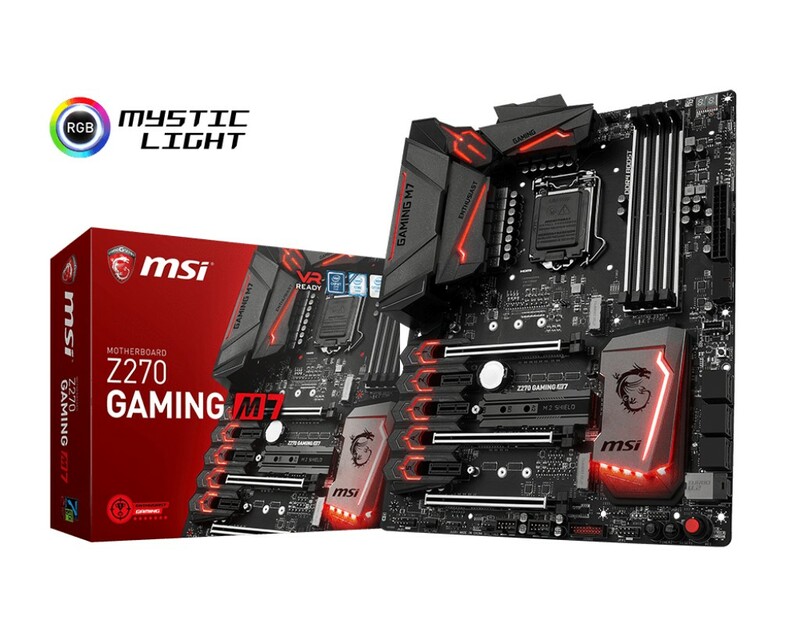 This is a premium offering at the top of the MSI Gaming range and it’s not going to leave you wanting more but might be overkill for many – but if you do like to splash out on some overkill… then seriously consider this board. 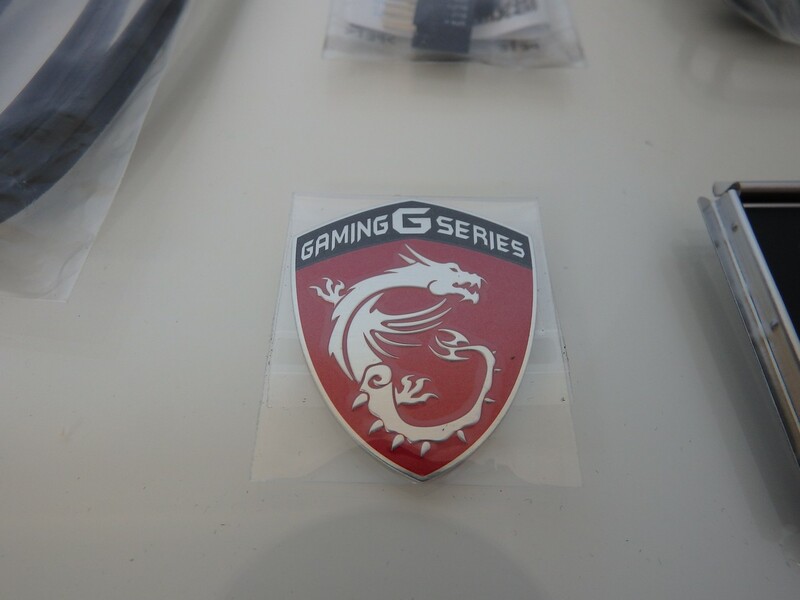 I’m genuinely sorry that I have to return this board to MSI after the review cycle – it’s the kind of board that I’d purchase for myself. 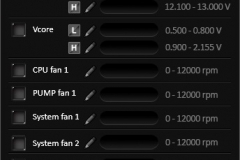 I like to overclock but don’t invest a lot of time into it, I appreciate faster storage access speeds and I’m a control freak when it comes to fan profiles, temperature control and network bandwidth prioritisation. 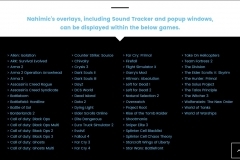 Whilst I won’t use a few of the utilities bundled into the package, the ones I would use are great. VR isn’t a big deal for me personally but having a focus on the technology is important as it starts to gain more momentum. 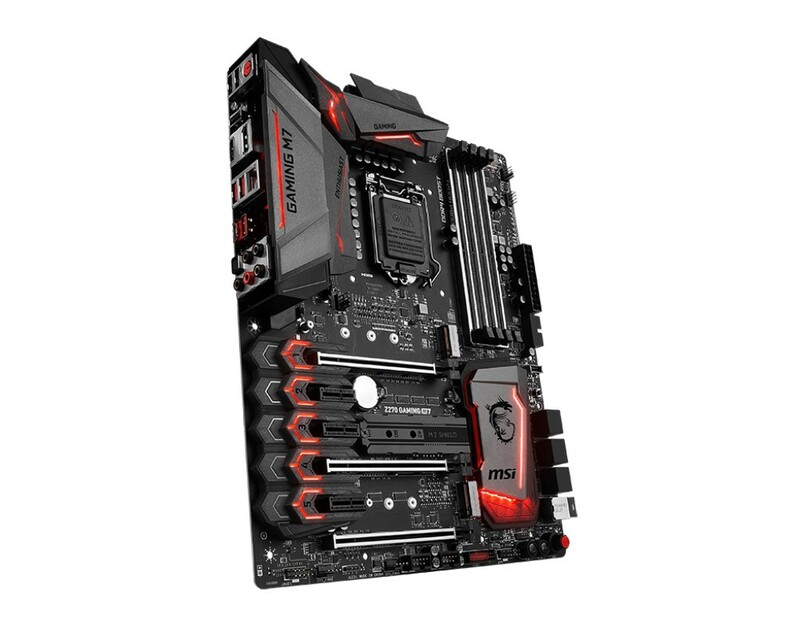 Likewise with the 3 Turbo M.2 ports and Gen 2 USB 3.1 – right now, it’s not as relevant to ‘gaming’ but this is a board that is built to last and whilst I dislike the term ‘future-proofing’, the MSI Z270 Gaming M7 has cutting edge technology implemented to see you through. 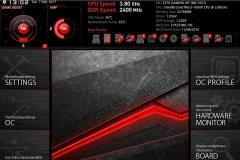 The aesthetic appearance, header locations and orientation are perfect as is the build quality. 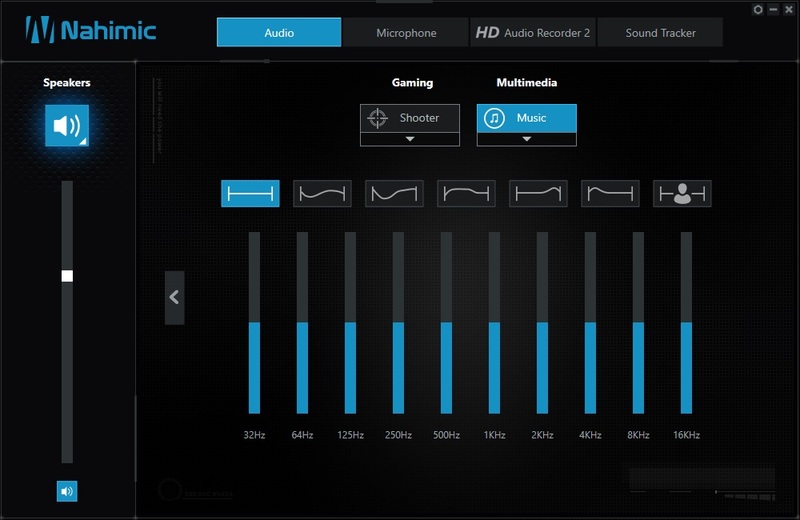 I really appreciated the Audio Boost 4 Pro sound platform with Nahimic 2 and if it takes 2 audio processors on the board to give me a consistent experience whether I use the rear I/O or the front I/O ports then so be it. 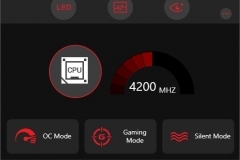 One last thing, the way MSI has implemented the BIOS, utilities and physical connectivity with the Z270 Gaming M7 has been very practical and intuitive. 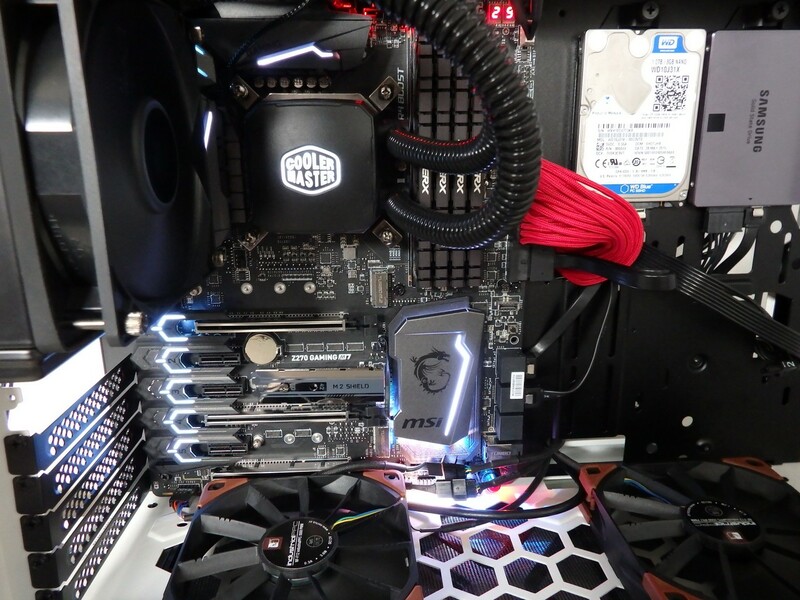 A semi-technical gamer could use this board to improve their knowledge pretty easily to become more of an enthusiast at their own pace. 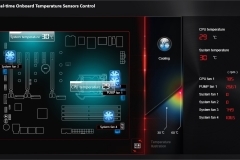 You can manually tweak the settings or let the board’s smarts do it for you – all in relative safety as long as you do a little research along the way. 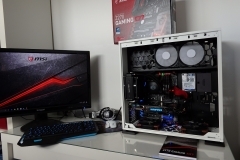 Next articleTriple Screen Gaming – Worth it or not?